Digital Welcome methodology focuses on digital inclusion and digital empowerment as a strategy to equip young refugees and migrants with the necessary skills to fully participate in the host society, including digital skills, but also pedagogical and soft skills to make connections with local people, volunteer, run workshops, be able to find a job, etc. This document should give an insight on how to prepare trainers and get newcomers to volunteer in a beneficial way for themselves and for the local population. 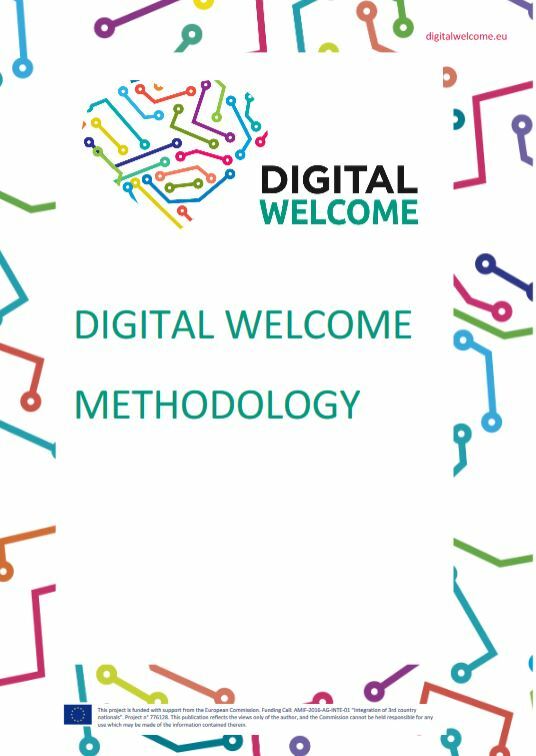 After a short introduction and explanation of what this methodology covers, all the specific and logistic information of this programme can be found in a second chapter called “Deployment of the Digital Welcome programme”. For instance, how and which participants should be recruited, the chronology of the programme, how to evaluate the training with the participants and how the structure of the programme is arranged in the different modules. The third chapter “Educational Goals” goes deeper into the four global learning objectives: how it stimulates problem solving and solution-oriented thinking; improves participants’ ability to communicate, express ideas and thoughts and interact with other people, especially from other (local) cultures; fosters digital thinking and promotes integration in society. The methodology move then on to an in-depth view of how informal and non-formal learning and focusing on 21th century skills is the backbone of this programme in the fourth chapter “Knowledge and Skills development”. The largest part of this methodology is the fifth chapter about the pedagogical approach in this programme for young third country nationals. It provides an insight on the advantages of peer-to-peer and project-based learning. But also, how to work with volunteers, refugees and migrants and why this is enriching for them, as well as for your organisation. Finally, links to references and glossary can be found.